Several years ago, I had two rare scopes mounted for side by side testing, a Takahashi FC-100N f/10 doublet fluorite and a Nikon 100mm ED f/12. Adjusting the balance of these scopes involved sliding the horizontally placed standard dovetail. I loosened the screws in the dovetail saddle, allowing me to slide the assembly back and forth. Unfortunately, the screws were too loose, which allowed the entire assembly to tip out of the saddle and plummet toward the cement floor! I managed to lunge out and catch the assembly with one hand, and miraculously the scope caught on a Y-cable, which broke the fall. This could have been a terrible disaster, but I escaped with only minor paint scrapes to the OTAs and mount, a damaged (but replaceable) $150 Y-cable, and a few cuts to my hand. This incident did, however, make me realize that I needed a safer saddle plate solution. Up until now, no alternatives to the standard dovetail were available. Stephen Pizzo is an astrophotographer who creates breathtaking solar photos. He uses a Lunt 230 H-alpha scope that weighs close to 70 pounds with rings and plate. Although Stephen is fit and can carry the scope, he has trouble mounting it safely by himself. 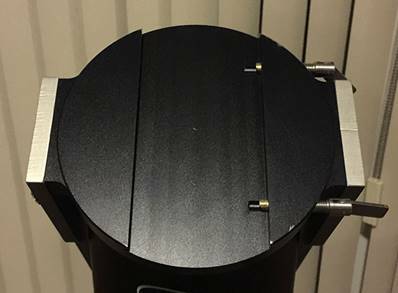 One method to make mounting easier is to install the rings first and to set the scope inside, but doing so without scraping the OTA is difficult with a heavy tube in a tall equatorial mount. Instead, he created a way to safely mount the OTA and dovetail together. Stephen and his business partner Hector Ortega made use of their background in developing advanced mounting solutions for aerial imaging systems, and engineered the patent pending Rayox dovetail saddle plate. The Rayox principle is simple. There are three basic positions for a dovetail saddle—open, balance, and locked. The sloping edges of the Losmandy system allow you to have a balance position that enables plate movement without the telescope tipping out. 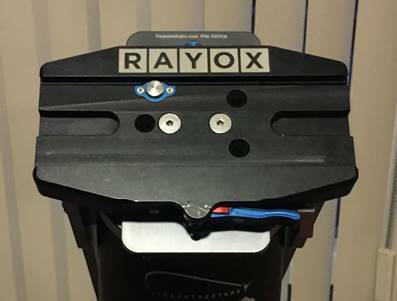 The Rayox’s ability to reach the balance position is repeatable and precise, as it uses an auto-engaging system with audible feedback. In contrast, with standard dovetails it is difficult to determine whether they are engaged while mounting a large scope. Most rely on knobs connected to screws to achieve a balance position. Using these knobs on a cold night can be difficult, especially with a large OTA where a lot of force is needed. 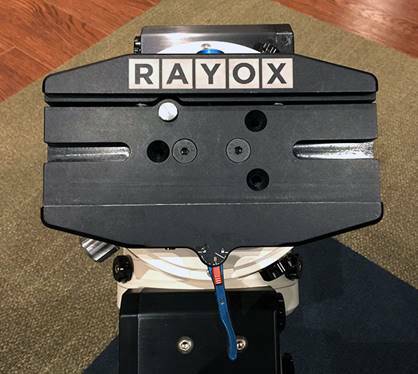 The Rayox cam lever provides a simple alternative to adjusting these knobs. The only other astronomical mounting system I have seen that used a cam lever saddle was the Nova Hitch mount, a very high end product produced in small quantities by Charles Riddel. Here are the positions of the Rayox saddle along with some of its unique features. This is the starting position of the saddle. Plates can be inserted in this position without risk of the scope tipping into the saddle. There are long middle slots that allow substantial travel of plates with socket head screw stops. Note that the blue cam lever at the bottom of the photo is in the leftmost position. This is an intermediate position, with the cam lever between the 2 o’clock and 5 o’clock position. In this position, the dovetail lip catches under the beveled edge of the saddle, allowing safe movement of the dovetail without it opening completely. Note that the cam lever cannot advance to the left (or move to the open position) without pulling on the orange safety tab. This safety feature helps prevent field accidents if a spectator pulls on the cam lever. The cam lever location is very convenient for closing the saddle. It is positioned on the same side of the saddle as your hands. The lever moves the top of the dovetail so that you do not lift the entire scope against gravity. In contrast, a standard saddle in a similar position has its knobs at the top and requires an awkward reach to access them. This is the standard closed position of the dovetail. Note that there is a knob on the saddle that adjusts the saddle’s width. This feature is crucial, as Losmandy compatible plates vary in their widths. When properly adjusted, the clamping mechanism holds the assembly very tightly. Another advantage of this system over a standard dovetail is that the Rayox uses the entire upper edge to clamp the dovetail, whereas other systems use only two or three screws or smaller clamps. Once you understand the positions, operating the saddle is simple. The saddle starts in an open position. When the dovetail is placed into the saddle, the large silver button is depressed, causing the saddle to close from the open to the balance position while making a clicking sound. You can adjust your scope laterally, and then lock the saddle by moving the cam lever to the right position. To adjust the scope, move the cam lever to the left. It will automatically stop when the saddle is in the balance position. Adjust the dovetail and re-lock the saddle with the lever. To open the saddle, move the lever to the left, then pull on the safety tab to release the entire assembly. The Rayox saddle comes with one adapter for a mount. Presently, there are solutions for Astro-Physics, Takahashi, Celestron, Orion, and Skywatcher mounts, but the latest list will be on the dealer website. Rayox labs is committed to creating interfaces for as many mounts as possible, and Stephen states that design and fabrication will typically take 7-10 days. 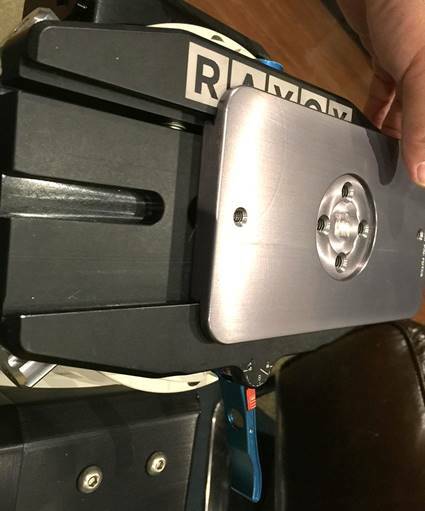 The photos show the Rayox adapter for the Astro-Physics 1100 mount that is also compatible with other AP GTO mounts. Since the holes in the Rayox saddle have a standard 35mm spacing, a Losmandy plate designed to hold Takahashi clamshell can be attached to the bottom of the saddle plate to insert into an existing Losmandy system. These plates are currently manufactured by companies like Farpoint and ADM. The hole arrangement allows this assembly to convert a standard Losmandy saddle to the Rayox system, in a standard or side by side configuration. The photos show a Track the Stars Panther alt az mount, which has a fixed Losmandy saddle, with the Rayox assembly inserted to give a side by side configuration. Unlike telescopes or eyepieces, a saddle will not usually improve your views at the eyepiece; instead it is forgotten during an observing session. However, the Rayox proved itself during several sessions with different scopes, dovetail plates, and mounts. Mounting, balancing, and dismounting the scope assembly was as easy as opening and closing the cam lever. I had no cramped hands from turning saddle knobs and my blood pressure was lower as a result of the safer operation. Overall, the saddle is of very high quality and works spectacularly well. An example of a system is shown below. 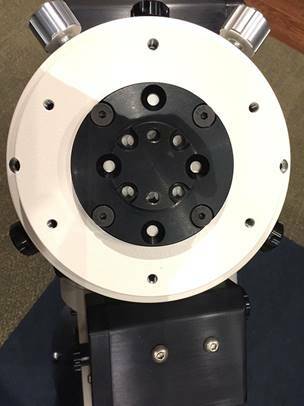 The AP 6” f/12 scope is awkward to hold and mount with a standard dovetail, but it is easy to set the entire assembly onto the 1100 mount when using the Rayox. The Rayox is heavy duty and therefore its weight (1300 grams) is approximately 50% greater than that of a comparable standard saddle. There are no technical disadvantages to this system. The biggest barrier is the price, which is two to three times the price of a standard dovetail saddle. However, for some of us with larger and/or heavier telescopes and camera equipment, this system is invaluable to protect against expensive accidents and the added functionality is worth it. Derek Wong received his first telescope at age 8 and has filled up a room or two with telescope equipment over the past twenty years. He has no financial affiliation with the company that produced the Rayox saddle but he does plan on getting a second saddle in the future. One of them will give the discount code in the Vendor's forum. I picked up one of these saddle plates and concur with Derek's findings wholeheartedly. I am a height-impaired, aging amateur who is terrified of dropping one of my OTAs as I secure it to my Losmandy G-11 mount. Since I am now retired, if I drop an OTA, there won't be a replacement. The Rayox has reduced this fear factor considerably. It is ideal for my situation. One thing that Derek did not mention is what a joy it is to work with Stephen Pizzo. He is very responsive to answering questions and open to suggestions for potential improvements to the attaching hardware scheme. Stephen has put a lot of work into offering a kit that works well on a myriad of mounts, yet did not flinch when I suggested a minor, yet important (to me) tweak. Bottom line: I am glad I invested my money in the Rayox Saddle Plate. I've got a box of old bicycle skewers. I use them for jigs and fixtures in the workshop and have often wondered why that cam action wasn't incorporated into a saddle. The click-in feature elevates this product above what I would have expected in a cam locking saddle design. I agree that Stephen was really easy to work with. He has been talking about a version of the saddle that holds narrower dovetails (Vixen, and hopefully others like AP sliding bars) after this model gets going. One thing I don't think Stephen realizes is the ease it will be for us "aging" armature astronomers with arthritis. It is such a pain balancing my 11" then tightening it up. then comes tear down when it is cold and the plate screws just wont budge. Embarrassing having to have someone help break the screws loose. Finally, just one click and it's out. PTL. Called Dr. "D" and ordered one for my G11 and G8. Thanks again for a great review. You are right, the Rayox is great for anyone who has issues with undoing the dovetail at the end of the night. I don't have arthritis and I still find it difficult to loosen the screws if I have used a large scope. Derek, your review couldn't have come at a better time. After a near miss, I decided to give the Rayox a go. My TOA (something like 60 lbs all in) is hanging on it as I type this. The finish is good and the fit is excellent. Adjustment to suit my Losmandy (I think) dovetail plate was painless. I was able to balance the tube on its axis in moments. Since tolerances are tight in an over-centre cam, I will keep an eye on the saddle's grip as the year warms up. If it's being used on a mount with lots of trailing cables (in my case a 900GTO.) Once everything is sorted out, it may be prudent to secure the lever with a cable tie, This could prevent it getting tugged into the balance position. How do I contact Stephen? This is the first time I saw broadcast/cine clamp idea transplant to amateur astronomy. It's long overdue. Similar clamps have existed for a long time, and widely. See Kessler, Cartoni, Oconnor, Vinten and many more. It's an industry standard. Yes, this type of clamp has been employed on photo tripods for many years. It's not new technology, except for astronomy use, and afaic ridiculously overpriced. If you ever experienced the trauma of seeing 3 of your most prized and delicate possessions slide off of a saddle and crash to the ground, I bet you would change your mind about what a safe and effective solution is worth. Add up what's sitting on top of your mount and then add to that the fact that for a very long time after such an incident, you'll physically cringe at the thought of it. I had that happen and I can tell you that as careful as I normally was, fatigue and distraction can happen. I really love my MyT mount but the Versa-Plate is not ideal for me. I have a Rayox saddle on top of my MyT now. It makes it so much safer to mount my rig, I consider it a necessity. In order to mount anything on the stock Versa-Plate saddle the came with my MyT, it needs to slide in from the front or back of the Versa-Plate rather than being able to rock it into place. 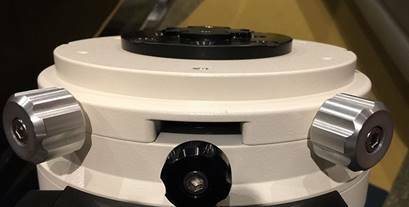 That's fine if you have a refractor using rings because you can easily insert the dovetail and rings first, secure them, and then place your refractor into the rings. One of my current setups is a TPO 10" Truss RC with a MoonLite NiteCrawler and an STT8300 and FW8G-STT. It has no rings and the whole outfit weighs about 50lbs. Yes, I can break it down into components but I prefer to avoid that if possible. For me, even just the RC at 34lbs is heavy in this situation. 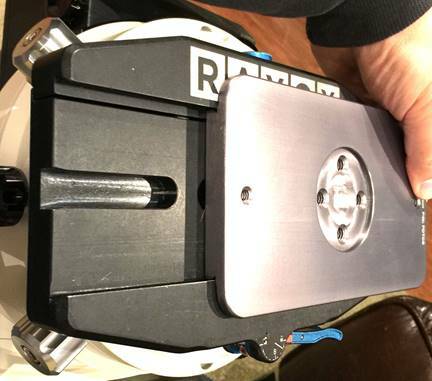 Lifting it up and sliding the D Plate into the Versa-Plate safely, without vibrating it and the mount to the point of affecting either collimation or polar alignment, or something even more catastrophic is tricky. It's also really hard on my back. With the Rayox saddle, I can much more easily and safely rock the whole rig into the saddle which then automatically engages the D plate and holds it safely. I have it marked so I can rock it in at just the right spot so it's almost perfectly balanced but it can still be adjusted safely in Balance mode with the lever halfway to closed. The lever that locks it down is easily closed with one hand and it securely holds everything very rigidly in place. If the lever isn't completely closed, it's plain to see that it's not yet locked down. When I think about doing it this way I feel the exact opposite of the cringe that I used to feel when thinking about mounting my rig. I'm actually testing the prototype of the model that is a replacement for the Versa-Plate and I'm extremely happy with it. I've been unable to have all three contact points engaged with my D plate on the Versa-Plate and maintain balance in the past but most of it is now engaged by the Rayox saddle and I'm confident that it is more rigidly held because of that. 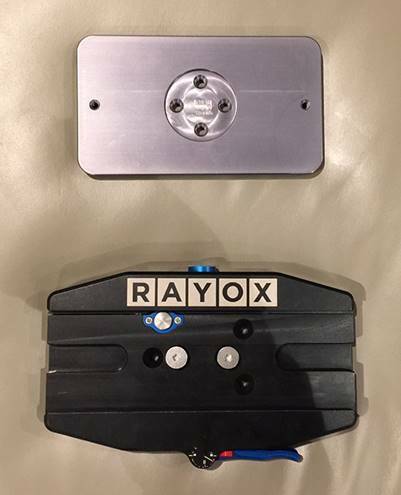 The functionality is the most important thing to me but the Rayox is a beautifully engineered, CNC machined piece of gear. The cost to machine the adapter plate and saddle out of high quality strong aluminum and anodize it must be substantial. I own quick release mounts for my DSLRs and this is a completely different animal. I think it's worth every penny. I've recently done some field testing of the Rayox with a Celestron C14 OTA. I see no advantage with a large OTA. It is nearly impossible to see where the OTA is landing into the saddle plate- might be easier with an open truss- the difficulty is visibility. The trip mechanism for the clamp is far too sensitive on my Rayox- it is possible to trip the clamp without griping the OTA rail. This is because the size of a large tube prevents you from seeing the exact position of your rail relative to the clamp. I tripped the mechanism many times before I found the sweet spot and this means you have to place the OTA back on the ground reset the trip & try again- it is really difficult to hold a 42 lb OTA in place six feet up for long. I'm sure this would be easy with a smaller diameter tube but anything above 11" OTA & you might hit this problem. It is also difficult to slide the OTA to balance with a big tube on a equatorial mount as gravity forces the locked rail against one side of the clamp making the assembly really difficult to move. I'm going to be removing the Rayox and going back to rings so I can see what I'm doing. 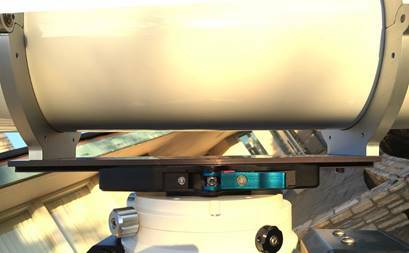 I will use the Rayox on a portable mount with a refractor where I feel it is more suited. You will note from the video with Woodlands presenting the Rayox that only a tiny tube was selected. I would like to see the same ease of use with a very large diameter tube- I think you would get a very different impression of the product. I'm not against the product in any way but I feel that the suitability needs to be carefully established before committing to a purchase. 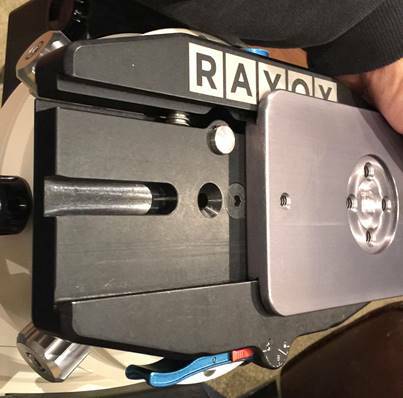 Can tilt saddle method with the counterweight bar horizontal and the OTA on a small table be used with the Ravox? Would that make it any easier? I'm sorry you've had trouble with the saddle and large OTA. I realize a much beefed video needs to be made. FWIW a great deal of my testing was done with a 230mm F7 Lunt LS230THa. It's quite heavy compared to other similar sized refractors due to the sizeable etalon and housing. It used to take two people to mount however I was able to mount it on my own using the RAYOX. If you believe the release is too sensitive that ive that is something we can quickly test and adjust. I'm planning to get a lift table so I can position the OTA on the corrector plate end the raise the entire tube to engage with the Rayox clamp. This will be far easier than having to hoist the big tube in the air to position the Rayox. I see a way forward with the existing rings for the RASA. I will mount the rings on an ADM rail and use the Rayox to grip the rail with rings attached. The RASA being a short focal length is not so critical of vibration errors so this should be a means to mount both tubes on the same mount. 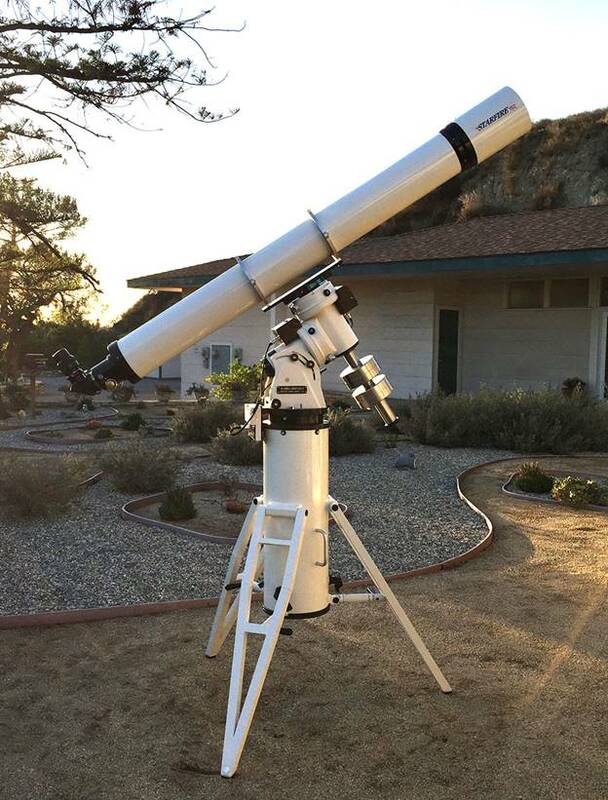 I have a new scope from OPT its their house brand called TPO (Third Planet Optics) 14" F/8 truss RC Made by GSO. Its being mounted on a Meade LX850 with the original large plate that is also used for mounting the starlock 80mm F/5 OTA. It was very difficult to slide the 14" into the rail system and tighten the bolts it took two people to help hold the OTA in place while I tightened the bolts, Man there has to be a better way!!! Next attempt at mounting this large 14" was much better it only took 2 of us this time and was easier to use the rosette knobs to tighten the rails. Iv added the rosette knobs to my list of upgrades for the Meade lx850 along with a few other mods that I have done to 4 of thies mounts so far to make them better and more user friendly. After finding out about the Rayox plate and doing a lot of research and watching their video I decided that this is the way to go. after the long wait it arrived and boy what a work of art"" very sleek, light in weight and strong. 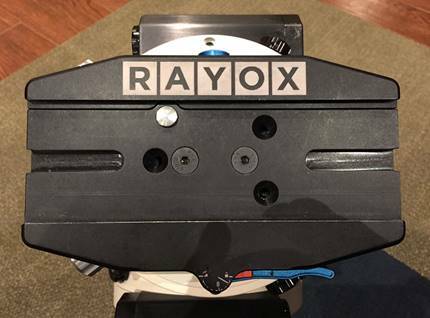 after I installed the Rayox plate I realized that the mount was now 10 LBS lighter O-boy this is even better! So now loading and unloading the mount is nicer and setting up on the tripod is easier without that over sized large saddle plate and I can now mount the 14" Truss RC by my self WoW!! what a difference this has made and a huge improvement on balance. Originally I was using 3- 26lb and 2- 10lb weights to balance the mighty 14" and now I'm only using the 3-26lb weights So the mount is now 20 LBS lighter loaded which means the drive system has less strain on the motors and worm gears. I will be adding a setup tutorial video on YouTube ASAP to my "meademods" channel on the new setup. Stay Tuned more to come...…. "Originally I was using 3- 26lb and 2- 10lb weights to balance the mighty 14" and now I'm only using the 3-26lb weights So the mount is now 20 LBS lighter loaded which means the drive system has less strain on the motors and worm gears." Not true. 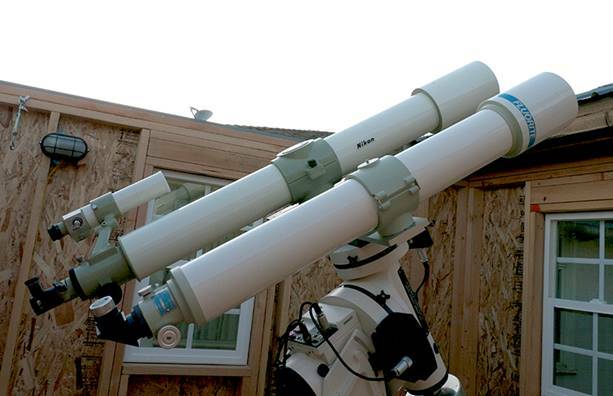 A correctly balanced telescope has no significant strain on the worm or gears. This is only a problem if you are out of balance & then the forces can be considerably more than the weight being pushed or pulled. The Rayox looks promising, and as a photographer, Quick Releases have been around for a long time, but they too can have their issues. 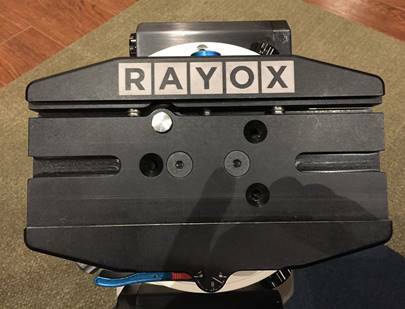 I'd love to see the RAYOX in action with a big 10" OTA to see if it helps!!! Thanks for the review!